This post will discuss the two most common eye signs that I see of elevated cholesterol. Xanthelasma. 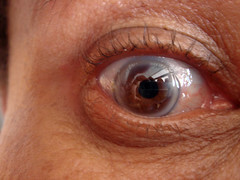 Light brown or yellow elevated patches on the eyelid. They are painless and are most common on the inner half of the eyelid. Corneal Arcus. White or grayish ring around the edge of the cornea. Many times only visible during the microscope portion of your eye exam. Both xanthelasma and cornea arcus are associated with elevated cholesterol. Interestingly, a study published in the September 15, 2011 British Medical Journal found that only xanthelasma were associated with an increased risk of heart disease.